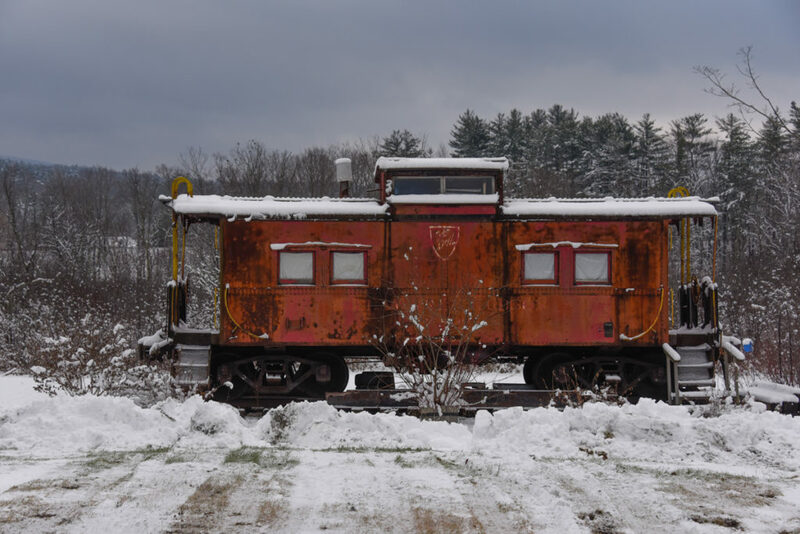 Like many an old Vermonter, the old caboose is chock full of character and charm. This one sits next to my friend Johnny Hinrichs’ shop on Rt 7A in Sunderland. It’s a good way to end the year as 2017 passes on through. I’ll take next week off and see you back here on Monday, January 1.
please consider posting a small version of the pictures your winners choose, to remind all your visitors of that specific picture. Or perhaps a link to that specific picture. Hi Noka, yes, if you hover your mouse over the print title above ie “Cow Crossing”, there is a link there for you. Tx! Many significant people worked the caboose and had a lot of responsibility. Glad to see this Vt. icon in a prominent spot. THANK YOU. Happy Trails…. and Merry Christmas . This painting reminds me of my late husband. Jon was an avid train lover because he grew up within the yards of the Rutland Railroad where his dad worked. He would often drop everything, gather our two dogs in the car, and take off for the nearest crossing when he heard the distant whistle telling him a train was coming. Not far from our home stands the remains of the East Clarendon Depot and a caboose – last used as a small restaurant and snack bar, but sadly now shuttered and offered for sale. The Whistle Stop. Thanks Sherry! Peter, thanks again as always for the great start to my week with a much needed dose of Vermont. Merry Christmas. I love your paintings. I love the breadth & variety of your subjects. Here you are painting in rural Vermont but each canvas feels new. I’m never bored. I love this train and all trains. They remind me of being a little girl back in Vermont playing near the train tracks and climbing in the box cars. I also loved walking on the train tracks to get to my fathers ice fishing spot. I’ve lived in NH for many years now so I love seeing your pictures of Vermont where my heart will always be! Your paintings are all beautiful and it’s hard to really have a favorite. That is great. A caboose like that sat on the tracks in Proctor for years! A caboose sat on the railroad tracks like that for years in Proctor! It is wonderful to go back in time! You captured the caboose so perfectly. You have great Talent! 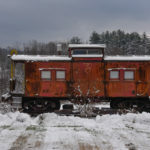 To me, warm colors of the caboose speak of the pleasant memories of years ago when I’d watch a passing train near my uncle’s house in Windsor, Vt., and anticipate its trailing caboose. The darkening sky and somber background landscape, seem, in contrast, to emphasize the subject’s enduring and resigned , yet rugged nature as it now sits in silence, its wheels without motion and in kinship with snow and ice. 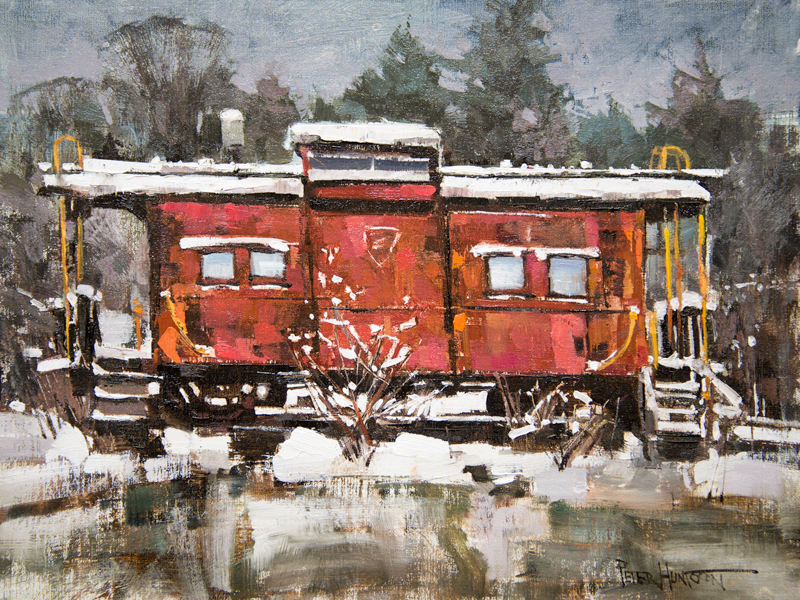 This caboose belongs to my friends Phil and Anne! And so it is, Peter. The end of the line remains the end. Only a lonesome part of the line, symbol of traffic, prosperity and connections between cities is standing in the snow. There is no traffic anymore. The years go by and at least we reach the of our own line. The artifacts will remain. Happy new year, Peter. Ah, but the memories, the spirit, and at least amongst us humans, the Love too remains! would subscribe but do not want email address published.